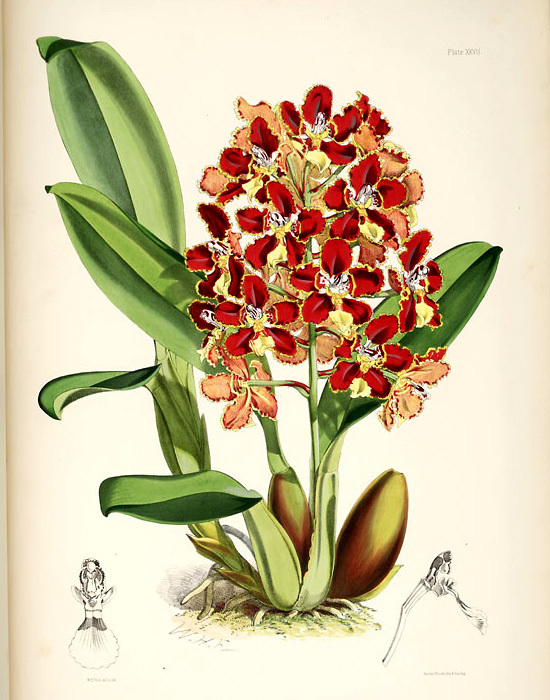 Since starting this blog, I've developed a certain fetish for botanical illustrations. For one, they're beautiful, stunningly gorgeous. Their colors are often lush in the way that Matthew Barney's Cremaster Cycle is lush; the pigments practically bleed out of the parchment. Although they are meant to be faithful (nay, exact) replicas of the real thing as demanded by scientific methodology, the process unwittingly translates biological matter into an abstract concept. Cells, tissues, stomata into data, lines, and RGB. The material into the immaterial. And in their uprooted, dissected, defoliated, trimmed, sectioned, decontextualized (yea, the whole shebang) representation, they're practically, to my eyes, extraterrestrial. Check out this Area 51 post-floral specimen. It's a pineapple, but it might as well be part of the Predator's Torquemadan arsenal or Ellen Ripley's next generation human-botanical-alien hybrid. 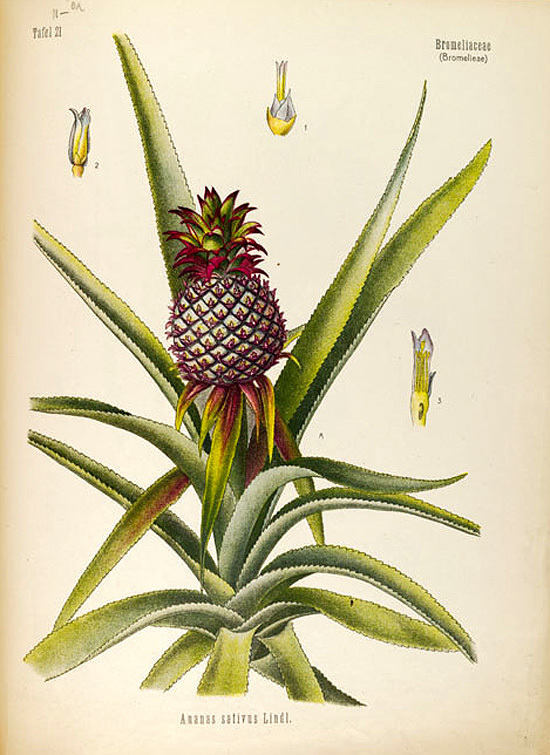 And in their Victorian, Linnaean, even Darwinian fetish for cataloguing and display and certainly in their cabinet-of-curiosities sensibilities, these botanical illustrations closely mirror the blogosphere. We had this idea of an installation involving a series of computers, hundreds of them, in a gallery. Or perphaps in hypermedia Times Square or in the TV showrooms of a Radio Shack. 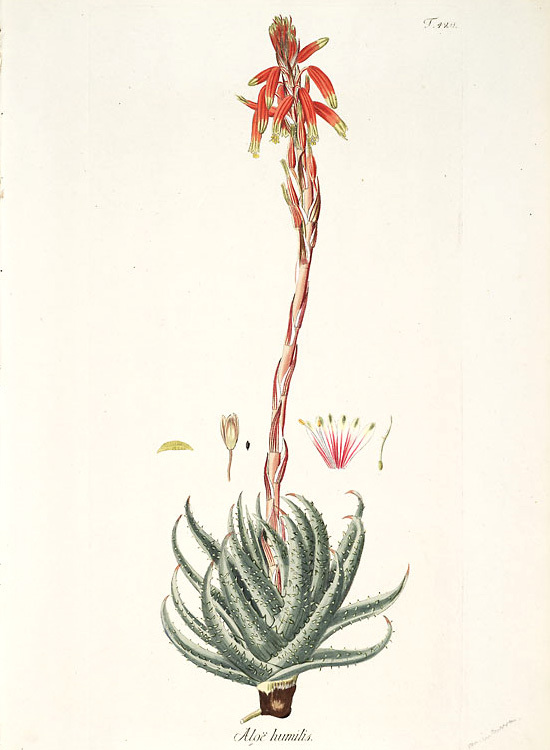 Or better still, at a botanical garden, the 4D sibling of botanical illustrations. In any case, each computer would feature one specific blog. As bloggers record their missives, their posts get disseminated immediately onto the computer screens. Rows upon rows of virtually illustrated detritus of contemporary life, each blogger's notion of the natural, lived world. Titled. Dated. Classified. Collated. Barcorded. Catalogued. Ready for perusal. Which brings up an interesting scenario: you could actually follow a meme or popular news item or even this installation propagating throughout the entire blogosphere, like a pandemic of sorts. Blogs cannibalizing other blogs in real-time. Meanwhile, here's another extraterrestrial specimen from the Missouri Botanical Library from which the images in this post were taken. anon: Thank you so much for the Kyoto link. Beautiful illustrations. And heather: Don't resist. Embrace your newfound fetish. Triffid! Run for your lives! !